1st - St. David of Menevia, Patron of Wales, Monk & Bishop, c.601. Became famous not only for his asceticism and devout spiritual life, but also for his compassion to the poor and sick. Founded the monastery at St. David's. - St. Eudocia, Penitent, Religious & Martyr, 152. A wealthy prostitute in Heliopolis. Hearing one night a monk chanting his prayers and reciting Mt. 25.31-46 she was filled with remorse for her sins. After instruction in the Faith was baptised and gave away her wealth. Became superior of a deesrt community of consecrated women. Martyred by beheading by the Roman authorities. - St. Antonia, Martyr, 306. A Christian in Nicaea when she was charged with insulting pagan gods. After refusing to offer incense to these deities, she was cruelly tortured and finally placed in a sack and drowned. 2nd - St. Chad, Bishop & Missionary, 672. Youngest of 4 sons, all of whom became priests after spending time in the monastery on the holy isle (Lindisfarne) under the leadership of blessed Aidan. For a time bishop of York, but graciously stepped aside after pressure from Rome, and went to the see of Lichfield where he spent the rest of his life travelling extensively to bring the gospel to those parts of his diocese still pagan. - St. Katherine Drexel, Foundress of the Missionary Sisters of the Blessed Sacrament, 1955. Estabished 49 foundations, including Xavier university in New Orleans. Canonised by Pope John Paul II in 2000. - St. Kunegund, Widow & Religious, 1033.After the death of her husband, St. Henry and Emperor of the Holy Roman Empire, Kunegund consecrated her life to God. Received the veil in the Benedictine convent in Kaufungen which she founded. Here she devoted her time to prayer, spiritual reading, lowly tasks and visiting the sick. - St. Gervinus, Abbot, 1075. Abbot of monastery at Saint-Riquier, France. Here he spent most of his time on his knees reciting the Daily offices and reciting the entire Psalteer often in a day. Also confessor for many pilgrims. Stricken with leprosy he asked is monks to take him to the high altar on Ash Wedensday when he departed this life. 4th - St. Casimir, Prince, 1484. Prefered to love a life of celibacy, devotion & austerity rather than as a military. Died at an early age, and at his tomb miracles began to happen. Lithuanians claimed his as their patron saint. - St. Adrian & Companions, Religious and Martyrs, 875. A missionary bishop in Fife region of Scotland. Founded a monastery on the island of May. In 875 Vikings raided the Scottish coast, killing Adrian and over a hundred fellow monks on Holy Thursday. 5th - St. Piran, Monk, c.480. Lived in north Cornwall & became the patron saint of Cornish tinners. His shrine was a popular centre for pilgrimage in the Middle Ages. - St. Phocas of Antioch, Martyr, 320. Tortured and martyred for his faith in Antioch, Syria. St. Gregory of Tours relates how any bitten by a poisonous snake was healed by touching the door of the basilica which contained his relics. - St. Eusebius of Cremona, Priest, 423. When visiting Rome in his youth met Jerome, and they becamew lifelong friends. These two with Paula and Eustochium built a double monastery. Jerome sent Eusebius back to Europe to raise funds for their building a hostel for the poor. In a letter, Jerome described him as a priest "filled with a glowing faith and love for the Lord." - St. Kieran, Bishop, 530. A hermit in the Irish countryside where he was joined by others. Led to a monastery at what ia now Saighir. Every Christmass Eve after Mindnight Mass at the moanstery he would travel to the distant convent of abbess Cuach where he celebrated Mass once again. Cuach had cared for him as a child. 6th - St. Colette, Religious & Reformer, 1447. After dreams & visions believed she was called to restore the Rule of Francis & Clare. She established many convents in France, Flanders & Savoy, of which the most famous is that of Le Puy. Like Francis she had a deep devotion to Christ's Passion. - St. Ollegarius, Bishop, 1137. A Spaniard who became prior of the French monastery of St. Adrian. In 1135 he reluctantly accepted the see of Barcelona, followed by appointment as bishop of Tarragona where he cared expdcially for the poor and mentally ill. Obtained from the Pope the same privileges for knights who fought against the Moors as the Crusaders were given. - SS. Cyneburga, Cyneswide & Tibba, Virgins, 7thC. The first two were Christian daughters of the pagan king of Mercia, Penda. Cyneburga although married to a Northumbrian prince lived a celibate life with him, who allowed her to enter a convent in Castor. Her sister was able to extract herself from her betrothal and lived withher sister in the convent. Tibba, a relative, lived nearby as an hermitess. - St. Cadroe, Abbot, 976. Returned to his native Scotland, after studying inIreland. Embarked on a pilgrimage to England and Wales. Whilst in London, by his prayers obtained a miraculous extinguishing of a fire that threatened this city. Later migrated to France where he was abbot of monasteries of Waulsort and Metz. - St. Conon the Gardener, Martyr.c.251. From Nazareth and migrated to Pamphylia where he settled and cultivated a small garden. Arrested during the persecution under Decius. Before the Roman prefect he stated, "I obey the great king who is Christ." He futhered added, "I am of Nazareth in Galilee; my family is that of Christ, whom I have served from my childhood and whom I recognise as the supreme God." Refusing to worship the pagan gods condemned to a torturous death by piercing his feet with nails and forced to run in fron of a chariot. As he fell he prayed "Lord receive my spirit." 7th - SS. Perpetua, Felicity & companions, 203, Martyrs. Both were young mothers when thrown to the wild beasts in the public arena in Carthage because they were Christians. An account of their awesome death & courage was circulated secretly amongst early Christians to inspire them to be faithful. - St. Drausius, Bishop, c.674. Bishop of Soissons, and famous preacher who converted many. Although physically weak,he lived an ascetic life. Founded 2 monasteries,one for men in Rethondes and one for women in Soissons in order to have religious praying for conversions. Year later Thomas a Becket invoked this saint for his prayers in his difficult time against Henry II. - St. Esterwine,Abbot, 686. Became abbot of Wearmouth Abbey where he had been a monk. A most humble and devout monk who died whilst the monks were chanting the night office. - St. Simeon Berneux, Bishop & Martyr, 1866. Became a missionary of Paris' Society of Foreign Missions. Went to Vietnam where he was captured and imprisoned and tortured in a cage. Although sentence to death was released through French intervention. Went to Manchuria. In 1854 consecrated a bishop and sent as vicar apostolic of Korea. Worked for 10 years before being arrested and executed with three other priests. 8th - John of God, 1550, Founder of the Order of Hospitallers of Saint John of God. After serving in the military, devoted his life to the care of the sick and founding hospitals. - Felix, Bishop & Missionary, 647. Known as the Apostle to the East Angles, after he firstly converted the exiled king Sigbert. Made Dunwich the centre of his See, established schools and monasteries. - Edward King, Bishop, 1910. Noted foremost for his holiness of life and advocacy of Catholic worship and theology. Appointed bp. Of Lincoln in 1885. - St. Julio Alvarfez Mendoza, Priest & Martyr, 1927. As the parish priest of Mechoacanejo, instilled a great devotion to our Lady as he travelled from door to door. During the persecution he refused to escape and styed to minister to his people. Captured on his way to say Mass in the early morning and executed. His body was left on the garbage heap near his church. - St. Veremund, Abbot, 1092. Abbot of the Benedictine monastery of Hydrache, Spain where he was a great advocate of the Mozarabic Rite. He also had a great devotion to Our Lady. One night c. 1080 shepherds observed falling stars. Going to the site they discovered a beautiful statue of the Madonna. At the request of the king of Navarra, Veremund founded a city on this site, Estella, dedicated to Mary. 9th - St. Frances of Rome, Founder & Succour of the Poor, 1440. Founded a society of devout woman under the Rule of St. Benedict, known as the Oblates of Mary. After her husband's death she became its superior. Noted for her work amongst the poor, especially in hospitals. - St. Bosa, Bishop, 705. A monk under Hilda at Whitby. In 678 consecrated bishop of Deira, which later became the see of York. St. Bede, his contemporary, described hims as "holy and humble" and "God's beloved bishop". - St. Felix de Rhuys, Abbot, 1038. In early life became a hermit on Ushant, France. Journeyed to Fleury-sur-Loire to pray before the relics of St. Paul Aurelian upon which he resolved to become a monk at Fleury. Later he was sent to re-establish a monastery in Rhuys. 10th - St. Macarius, Monk, c.390. Founded a monastery in the desert of Scetis. Highly esteemed by many, including Evagrius. 11th - St. Eulogius of Cordova, Theologian & Martyr, 859. An apologist for the Christian Faith in Moorish territory. Executed eventually for hiding a Christian convert. A devout priest who spent much time visiting hospitals & monasteries. - St. Aurea, Religious, c.1100. Became a nun in the Benedictine monastery of San Millan de la Cogolla. Here she lived as a hermit where she experienced a vision of those virgin martyrs: SS. Cecilia, Agatha and Eulalia. Eulalia also showed her a vision of heaven filled with greenery and many wild flowers. Aurea's sanctity led to many asking for her prayers. 12th - St. Alphege of Winchester, Bishop, 951. Important in the 10thC. monastic revival for the encouragement he gave to Dunstan & Ethelwold. Bishop of Winchester. - St. Theophanes the Chronicler, Abbot, 817. A courtier of the Byzantine Emperor Constantine V. After marrying he and his wife agreed to separate to seek the monastic life. He entered a monastery on Mt. Sygriane. Later he became abbot of a nearby monastery founded by him. Suffered for his opposing Emperor Leo on iconoclasm, and died as a result. Composed a valuable chronicle of world history. - St. Maximilian, Martyr, 295. The son of military veteran, and therefore required to serve in the army. He refused because he was a Christian. In Theveste in North Africa, he was thus sentenced to death by beheading. His father who has supported him in his refusal died soon after. 13th - St. Roderic, Priest & Martyr. Intervening in a fight between his 2 brothers, one a Mohammad, & other a lapsed Catholic landed him in strife, resulting in his martyrdom for the faith. - St. Ansovinus, Bishop, 840. A hermit near Torcello, Italy. Became bishop of Camerino, and was known for his healings of the sick. - St. Nicephorus, Patriarch, 828. Defended the veneration of holy images against the emperor, Leo. Denounced at a synod by Emperor and his supporting bishops. Thus exiled and spent his remaining years in a monastery near the black sea where he continued his writings to defend religious images. 14th - St. Matilda, Widow, 968. Noted for her piety & charitable deeds. Her son Otta became Emperor of the Holy Roman Empire. Founded monastery. - St. Lubin, Priest & Martyr, 557. AS a youth worked in the fields near Poitiers. Learned to read by having a monk inscribe the alphabet on his belt. Later became a monk of the Abbey of Ile-Barbe. When abbey plundered by Frankish soldiers was tortured and left for dead. Survived to become bishop of Chartres. 15th - St. Louise de Marillac, Religious, 1660. Vincent de Paul became her spiritual director after the death of her husband. Worked with him & founded the Daughters of Charity. Travelled France to establish houses. Patron of Social Workers. - St. Zachary, Pope, 752. After his election as Pope in 741 confronted the Lombard king over territory seized and future aggression. As a result seized land handover and peace prevailed. Intervened in the slave tradeof children and fed the poor. Supported Boniface in his missionary work in Germany. In a letter to him he described the ancient practice of burning three large lamps in a hidden place during the Triduum. 16th - St. Finan Lobur, Abbot, 6thC. Ruled over the monastery of Swords, north of Dublin & perhaps over Clonmore where he was buried. - St. Heribert, Bishop, 1021. Christmass Eve, 998, walked barefoot to the cathedral in Cologne, where he was consecrated bishop. A zealous pastor, he cared for the sick and enforced discipline on his clergy. During drought he called for a penitential procession between the two churches in Cologne. On reaching the church of St. Severinus, he prayed fervently. Immediately heavy rain began.When death was near asked to be taken to the Gero crucifix in the cathedral where he died soon afterwards. 17th - St. Patrick, Bishop, Missionary & Patron saint of Ireland, c.460. A Briton captured as a slave when 16 and taken to Ireland. After 6 years escaped to the Continent. Much influenced by Martin of Tours. In early 40's returned to Ireland as a bishop, making his see at Armagh. He brought the Gospel on foot to the Irish. Before he died his monastic and diocesan structures guaranteed. - St. Joseph of Arimathea, Disciple, 1stC. Member of the Sanhedrin and thus a secret disciple of Jesus. Took the body of Chirst from the cross and wrapped it in a fine linen cloth before he buried Him in a new tomb. An apocryphal work,Acts of Pilate relates how Joseph collected some of our Lord's blood in a vessel that had haled the paschal lamb at the Last Supper. This became associated with the mediaeval legends of the Holy Grail. - St. Paul of Cyprus, Martyr, 760. During the iconoclastic time under Emperor Constantine V, Paul was ordered by the governor to trample upon a crucific or face the rack. Bending to pick up the crucifix, he kissed it, and stated, "Far be it from me, Lord Jesus Christ, only begotten Son of God, to trample on your divine image." Thereupon he was placed on the rack and after torture, was put to death by being hung downwards into a fire. 18th - St. Cyril of Jerusalem, Bishop & Theologian, 386. 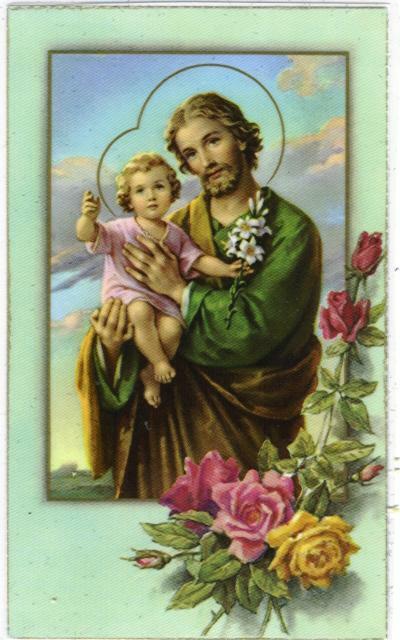 Best remembered to-day for his Catechetical lectures, given to prepare Catechumens for their baptism at the Easter Vigil. Was bp of the holy city when Egeria made her famous pilgrimage, leaving us so much information about Holy Week. - St. Frediano (Frigidian), Bishop, 588. An Irishman when on pilgrimage to Rome saw the hermitage on Mt. Pisano, near Lucca and resolved to become an anchorite there. His holiness soon became known and was appointed bishop of Lucca. During his episcopate the city was sacked and burned by the Lombards, Succeeded in conveting many of the conquerors. Cared for the poor and in the community of priests he lived an austere life. Also known for his miraculously ending a flood by diverting the river. - St. Salvator of Orta, Religious, 1567. As a Franciscan of Tortoss assigned to beg for alms, during which he healed many sick by making the sign of the cross over them. Transferred to another friary the sick soon traced him. Amongst those healed was a ten year old girl blind from birth. Had a great devotion to Christ and Our Lady. - Ten Thousand Martyrs of Nicomedia, 303. In February, 303, Diocletain issued an edict in Nicodemia against Christian worship. Using two fires in the Emperor's palace as pretext, Christians were rounded up and slaughtered. Well over ten thousands were killed. 19th - St. Joseph. The Gospel depicts the guardian of our Lord as a good man and a carpenter. He trusted in the Lord by taking the young Child to Egypt to escape the slaughter of babies by Herod. 20th - St. Cuthbert, Bishop & Missionary, 687. A very holy man who ended his life on the island of Farne. As abbot and bishop of Lindisfarne he preached the Gospel tirelessly. 21st - The Passing of Benedict, Abbot, c.550. It was described like "a magnificent road covered with rich carpeting and glittering with thousands of lights. And there in the brightness stood a man of majestic appearance" announcing this was the "road taken by the blessed Benedict". - The Martyrs of Alexandria, 342.When Athanasius returned to his see of Alexandria, the Arians persecuted the Orthodox Christians. On Good Friday 342, an Arian mob ran amok in a church where Orthodox Christians were worshipping. Many were slaughtered and trampled to death, others taken as prisoners, and some were scourged publicly. Church was desecrated as well. - St. Serapion, Bishop, 370. Served as head of the Catechetical School of Alexandria before retreating to a desert monastery where he befriended Anthony. Chosen as bishop of Thmuis in lower Egypt worked with Athanasius against the heresies of his day, including Arianism and Macedonianism. As a result was banished by Emperor Constantius and died in exile. He is the author of Euchologion of Serapion, containing 30 prayers for the Mass, Baptism, Confirmation, Holy Orders and Anointing the Sick. 22nd - St. Basil of Ancyra, Priest & Martyr, 362. Defended Bp. Marcellus in his fight against Arians. Deposed by them. Under the rule of Julian the Apostate was tortured and slain for preaching to the people. - SS. Callinica & Basilissa, Virgins & Martyrs, 251. Whilst visiting other Christians in prison in Galatia, they were also arrested and beheaded for the faith. - St. Deogratias, Bishop, 457. After Vandals had sacked Tome, many people were seized and taken to Carthage. Here the bishop ransomed as many of these as he could. Arians resentful of Deogratias tried to assassinate him, but he survived. 23rd - St. Turibius of Mogroveio, Archbishop, 1606. As a layman he was appointed principal judge in the court of the Inquisition at Granada, and then archbishop of Lima. Grudginly he received Holy Orders and went to Lima where he established a seminary for training priests. Learnt Indian dialects in order to champion their rights against Europeans. Worked to alleviate poverty. - St. Benedict the Hermit, Religious, c.550. A young hermit observing the monastic rule in Campagna region of Italy. Invading Goths attempted to burn his hut and kill him, but he survived. He was then thrown into an oven and again survived. He was set free afterwards. 24th - Walter Hilton of Thurgarton, Monk & Mystic, 1396. An Augustinian highly regarded for his spiritual guidance. Translated Latin devotional works. Best known for The Scale of Perfection. - Oscar Romero, Bishop & Martyr, 1980. After his appointment as Archbishop in 1977 courageously spoke out against the violence and injustices in San Salvador. Shot while presiding at Mass on this day. - St. Aldemar, Abbot, c.1080. Founder and first abbot of monastery at Bocchignano. Founded several others afterwards too. Known for his sanctity and healing powers, including restoring a woman's hand to strength. 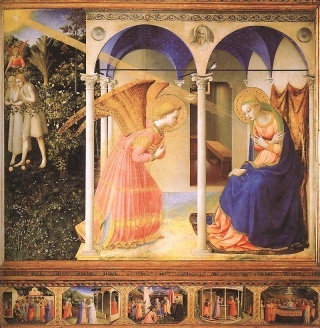 25th The ANNUNCIATION. "So the Incarnation of Christ, and the Annunciation of the blessed Virgin, - his being incarnate of her, and her blessedness by him, and all our blessedness in him with her, make it as well our Lord's as our Lady's day." 26th - St. Ludger, Missionary & Bishop, 809. Following in the footsteps of Boniface preached in remote parts of Frisia. In 804 consecrated bishop of Munster where he built a monastery. Not afraid to keep Charlemagne waiting unti he had finished his devotions. - Hariett Monsell, Monk, 1833. Founder of the Community of St. John the Baptist, Clewer. Under her care undertook a range of social work such as orphanages, schools and hospitals in many places, including India & America. 27th - St. Rupert, Bishop & Missionary, 717, Appointed bishop of Worms & then dedicated his life to a missionary which brought him to Luvavum, renamed Salzburg & became its first archbishop. - St. Matthew of Beauvais, Martyr, 1100. A knight from Agnetz, France. Accompanied his bishop, Roger on the first Crusade. Captured by the Saracens, he was promised freedom if he denounced the faith. He replied he would give his answer on Friday, which happened to Good Friday. "I give my life to him who laid down his for mankind." With that answer he was immediately beheaded. 28th - St. Alkelda, Religious & Princess, c. 800.Tradition has it that was she was strangled by Viking women and buried in the church at Middleham, Yorkshire. - SS. Priscus, Malchus & Alexander, Martyrs, 260. Lived an ascetic life in Caesarea in Palestine. During the persecution under Valerian, they decided to show their support for their fellow Christians by publicly confessing the Faith in front of the Roman authorities. Were tortured and thrown to the wild beasts. - St. Tutilo, Monk, c.915. A monk at St. Gall and talented headmaster of the cloister school.In music he contributed greatly to the devlopment of the trope, a musical and verbal elaboration of the Kyries. But still was a monk of great humility. - St. Leonard Murialdo, Religious, 1900. As a priest took care of boys in Turin entrusted to him by John Bosco. A great advocate of workers' rights. In 1873 founded a men's religious institute dedicated to the education of the young, the Congregation of St. Joseph. A very spiritual priest who had great devotion to our Lady, St. Joseph, and a great love for the Mass. 29th Jonas and Barachisius, two brothers of the city Beth-Asa, Martyrs in the 4thC. Encouraged Christians who were to die for the faith in Persia under King Sapor. They too were martyred when they would not worship the moon and the stars, fire and water as they proclaimed there is only one of the heavens. 30th - St. John Climacus, Abbot of Sinai, 649. Noted work is "Ladder of Perfection" (Climax) in 30 chapters to honour the age of Christ when baptised. 31st - John Donne, Priest & Poet, 1631. As Dean of St. Paul's Cathedral, a popular preacher. Wrestled with his own inadequacies and sins, reflected in poetry & sermons. "Wilt thou forgive that sin where I begun,/which is my sin, though it were done before?"
. - St. Benjamin, Deacon & Martyr, 424. After bishop Abdas mistakingly burned a pagan temple in Persia, 40 years of persection followed against Christians. Amongst those was Benjamin who was released from prison after a year by the ambassador who has promised King Varanes that Benjamin would never again speak about his faith. However Benjamin had other ideas and was re-arrested, tortured and executed. On this day we commemorate the Annunciation - that day when the angel Gabriel appeared before Mary, a young Jewish lass, with the message that she would be the mother of God. She would conceive a child by the power of the Holy Spirit who would be the promised Messiah and redeem His people from their ransom and captive.